LEARN HOW TO WRITE LIKE THE EXPERTS, FROM THE EXPERTS. 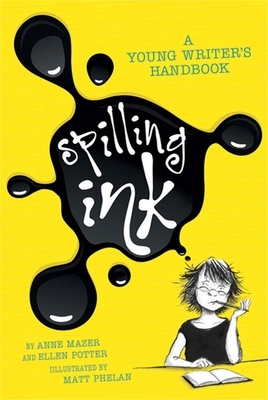 In Spilling Ink: A Young Writer's Handbook, you'll find practical advice in a perfect package for young aspiring writers. make revisions, and overcome writer's block. Fun writing prompts will help young writers jump-start their own projects, and encouragement throughout will keep them at work. Ellen Potter is the author of books including The Kneebone Boy, Slob, Pish Posh, and Olivia Kidney. With Anne Mazer she is also the author of Spilling Ink: A Young Writer’s Handbook. Potter grew up in a high-rise apartment building in New York City’s Upper West Side, where she exercised her early creativity by making up stories about the neighbors she saw on the elevator. When she was 11 years old, she realized all the best books were written for people her age, and so she decided to become a children’s book author. She studied creative writing at Binghamton University, and then worked many different jobs while continuing to write. She was a dog groomer, construction worker, art teacher, and waitress. She lives in upstate New York with her husband, son and a motley assortment of badly behaved animals. Anne Mazer is the author of The Salamander Room, The Sister Magic series, and the bestselling Abby Hayes series. She lives in Ithaca, New York.